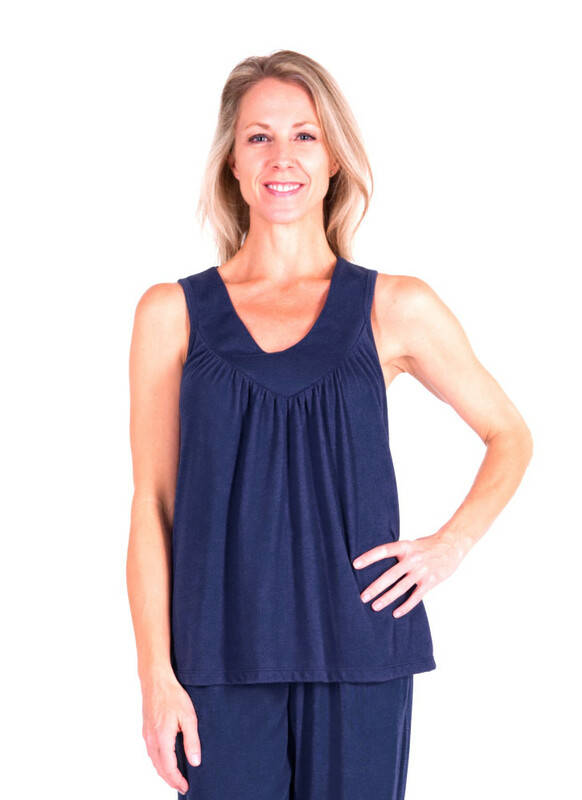 Style #T4963 If you're looking for wicking sleepwear that is also stylish, this Mix & Match Moisture Wicking Gathered Tank Top from Cool-jams™ is a great choice. It features a V-neck top with a gathered detail across the bust, as well as a loose-fitting bodice that will keep you truly comfortable. Choose from a variety of stylish colors to pair with our other wicking pajama pieces and create your very own set. To prevent the annoyance of night sweats, this women's sleep tank top is made of our unique Cool-jams™ performance fabric that wicks away moisture while also eliminating odor-causing bacteria. 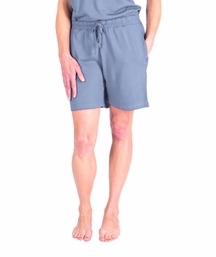 It has a silky, lightweight feel that is just as soft as standard cotton, and because it is very wrinkle-resistant, this is even a great choice for anyone who frequently travels. Garment weight approximately 3 oz. Wash in cool or warm water on gentle cycle. Never use fabric softener or fabric softener sheets because it will minimize the wicking properties of the fabric. If you accidentally use fabric softeners, re-wash the moisture wicking gathered tank top in clear water to remove softener residue, so the wicking properties will return to maximum effectiveness. Lay your garment flat or hang to dry. Tumble drying won't damage the garment, but can sometimes create static. I decided to try these tops in anticipation of a trip to a warm climate. I then decided to try them before I left to be sure I like them. I really do! They are comfortable and keep my body temperature stable. Before using these my body temperature would fluctuate between too warm and too cold. I was so comfortable that I was able to raise my bedroom temperature 2 degrees (yes, I do use a fan as well) and was comfortable all night long. I�m hoping these tops will reduce my summer cooling bill here in the Phoenix area desert. This is my favorite warm weather pajama top! It is comfortable, drapes nicely, and both wicks moisture and allows air flow. I bought this in two colors to wear with the pajama shorts or capris, replacing all of my non-Cool-jams pajamas! 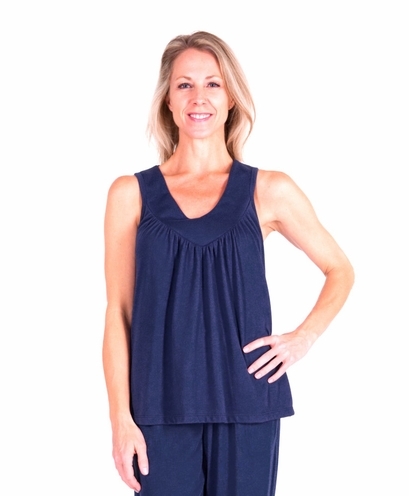 soft fabric is comfortable against skin and makes for great pajamas! Im so so happy to have discovered Cool Jams! For the first time, my pjs were not soaking wet when I woke up. They are super comfortable and look great as well. Just need a few more color choices. I love that there are several style options to choose from, and that they can be mix and matched. Ill definitely be purchasing more. I run hot all the time. These pajama tops are the best thing for staying cool at night. No more night sweats. I bought more as I wear them from the minute I get home. The material is light and so much better than other pajamas or T-shirts I have worn. I love my new pj's! I used to wake up and have to change after a nightly hot flash. I don't quite understand the science of the material of these pajamas, but what counts is that they work! I still have nightly hot flashes but the material is never damp. I HIGHLY recommend these! I love the material of the pajamas, very soft and comfortable, but also warm to the skin and a little luxe feel to it. Delivery and follow-up service were great. I usually wear a size 2 and wondered about fit as there was no XS offered in anything I bought but the S fits fine. The material is very soft &amp; light.... similar to a brand that has gone out of business. The material felt cooler &amp; silky to me. However, as a sleeveless top, I kept this. The pattern makes for an attractive, yet loose and comfortable fit and the colors are nice. I would consider another purchase down the road. Improved sleep dtramatically compared to regular pjs. Still get the hot flashes but diminished and no longer followed by the chills! Very cute pj top to go with the drawstring bottoms I purchased. I like the pink color and was happy to see that now there are more color choices. If you have to wear wicking pjs to stay cool, might as well be cute. These are not your mamas pjs for sure. This top is very stylish and nice that I can buy it to go with so many other items. The fabric is much cooler than cotton and for people who sweat...dries so quick. Easy to wash just don't use fabric softeners because their customer service gal explained to me that it takes away from the wicking. I just washed my Cooljams in regular water after I made the mistake and the wicking works once again.